Ok - today is the 7th day. So far so good. I'm losing weight, and actually I am not miserable either. I do realize that I will lose more weight in the beginning and it will slowly taper down - but as long as I'm losing weekly, I'm happy. One thing I did when I started was download a calorie counting app for my phone. 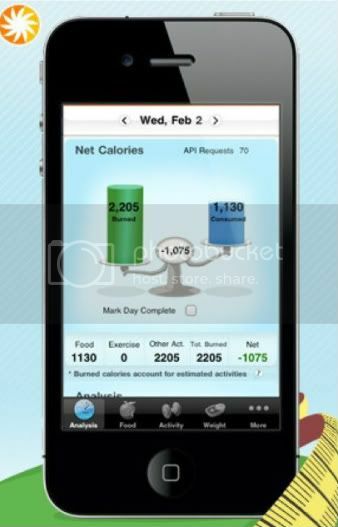 I got Calorie Count - no science behind it, it was one of the first ones to pop up in my search, had good reviews and I liked the screen shots. Works like most I bet.. you enter your personal info (age, weight, height, etc) and then it gives you the amount of calories you can burn for the day. It has a food log to enter everything you eat, with the calories built into it to make it easier (you can use this feature or just enter your own too). As you exercise you can enter it in there also adding to the calories available for that day. 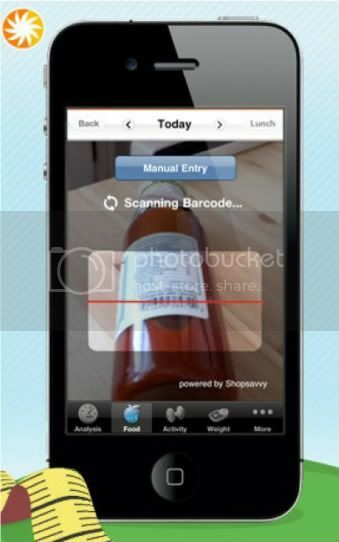 It also has a scanning feature - you can scan the bar code from a food or drink and enter the portion you had to get it in the log also. Overall I'm happy with the app so far. The biggest thing I have learned this week is I must have been eating a scary amount of calories some days. I mean things I used to eat thinking they were healthy have crazy calories. For example... I used to like to eat salsa and chips (and I still do). But I looked at the calories and the salsa is fine but the chips. HOLY COW! 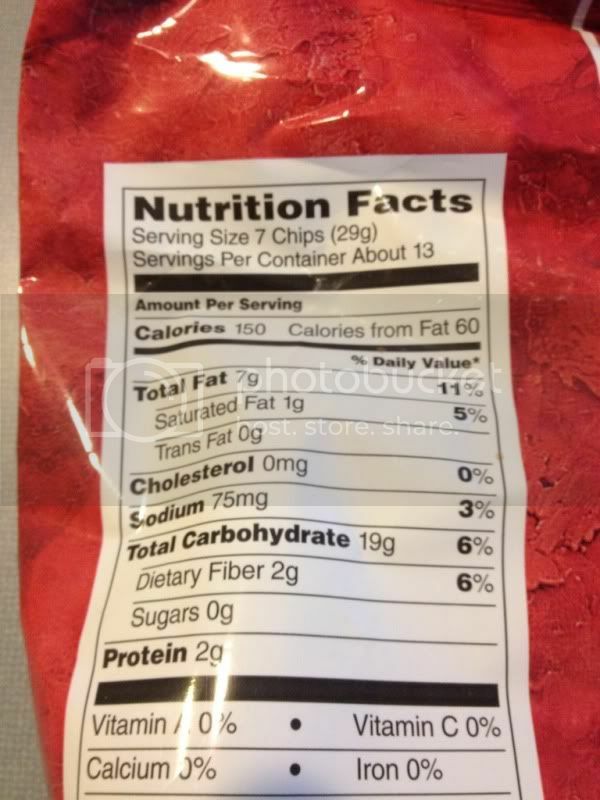 The Kroger tortilla chips we have are insane high on calories. for 150 calories you get seven chips. SEVEN! Who eats just 7 chips? 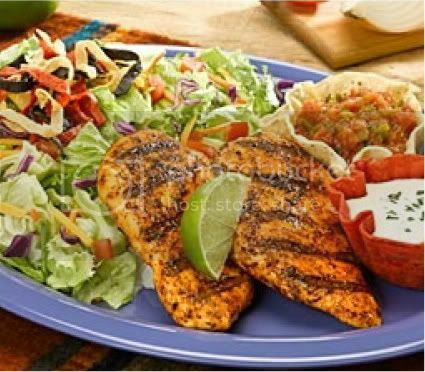 I learned that for less overall calories I can have 3 ounces of lettuce (which is about a 1/3 of a bag of shredded lettuce), a grilled chicken breast (4ounces), and lite Italian dressing. After the salad I would feel satisfied, where as the chips and salsa I would be still be chowing down, or looking for something in the cabinet sweet to offset those chips. One other fear I had was eating out - how would this affect my calories, and how in the world would I figure it out. Well, we ended up going to Red Robin on Wednesday. I was worried about this all morning Wednesday. I talked with my sister Holly, and she told me they had the nutritional info on their website. So I went there and found they had a app for it too. I downloaded it and started checking things out. I ended up getting the Esanada Chicken Platter. It came with two chicken breasts, a salad with a chipotle dressing, and a tortilla scoop chip with salsa in it. All of that and a couple glasses of water I was out of there at 704 calories. Bingo I did it. And the meal was very filling and good tasting. The other thing I noticed this week. Energy loss while exercising on a lower calorie diet. On Sunday (the 2nd day in to the diet) I went for a 3 hour bike trainer ride (riding my bike on a indoor trainer). And at 2 hours 26 minutes I ran out of gas. No more energy. To the point that I couldn't even turn the pedals over. I looked at what I ate before and it just was not enough before that kind of workout. So Tuesday I planned it differently. I ate my normal breakfast, a mid morning snack, lunch, afternoon snack, and an early dinner - I think I was at around 1200-1300 calories before the ride, this way I could have some recovery food after the ride. Tuesday night was a 2 hour trainer ride. I ate powerbar during the ride adding energy. At 1 hour 30 minutes - just felt tired again... not as bad as last time - but definitely not full power. So now Thursday is the next one. I started the day again eating the same -but at the afternoon snack and dinner I ate more. I went into the ride at 1800 calories, and ate a power bar and a gel pack in the workout. Two hours done. Perfectly - felt great. So my current thought it more calories before those workouts. Because I burn so many calories during these workouts - I have to load up before. Anyways that is all I have today... Last Saturday I started this adventure at 224.6lbs and today I am at 215.8lbs. Week one I'm down 8.2 pounds, I am a ton more calorie aware. If I can continue losing I will be happy- just 2 pounds a week is my goal. I want to lose it and keep it off. I don't want to lose muscle, so I will continue my workouts to keep up the progress. If you are still reading this, Thank you! I am posting this to show others the struggles of weight, things I find out as I go, and hopefully to motivate you a little. Fred, as you probably know-always combine your carbs with a protein, it keeps you fuller longer. And carb up before workout, protein after (I know you know that). So happy for you and you are inspiring all of us at CCC! Motivation...CHECK! you definitely keep me going! Congratulations! ! !